Again, one’s memory can readily play tricks, but I think I can say with a good degree of certainty that this Walküre, like its Rheingold predecessor, marked a considerable improvement upon the performance I saw two years ago. How much of that relates to revision of Frank Castorf’s staging and how much to individual (and indeed ensemble) performances onstage, I am not entirely sure. Perhaps that is as it should be, for a performance without a little mystery – if not necessarily the mystification that might be seen as the ‘bad nineteenth-century’ part of Wagner’s, still more Wagnerian, aesthetics – will generally be found lacking. 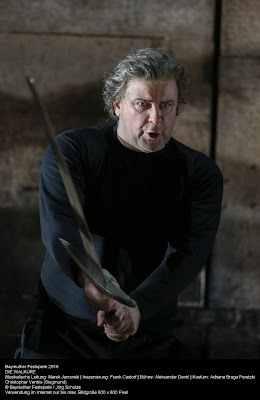 It certainly, I think, made a difference having Christopher Ventris as Siegmund. In 2014, although Johan Botha could certainly sing the role – not something to be taken for granted, naming no names – his inability to act was a problem one could not simply ignore. Now, with Ventris at least Botha’s vocal equal, albeit very different in tone, but also a committed stage actor, the first act and the end of the second looked up completely. There are many different ways to sing Siegmund, and Ventris’s, perhaps inevitably, comes closer to the sound we expect from a Parsifal; his is not a baritonal tenor. Nor need it be; this beautifully, though never just beautifully sung, performance, equally attentive to words and music, was quite beyond reproach. I was tempted to ask why we seemingly never hear Ventris in Britain any more, but why should we? Germany surely has much more to offer him. Heidi Melton, on much better form, or rather much more consistent form, than as Isolde recently at ENO, offered a heartfelt reading of Sieglinde. Occasional intonational wobbles counted for little or nothing when set against such palpable sincerity and range. Much the same might be said of Catherine Foster’s Brünnhilde. Foster has always struck me as a very likeable artist, not at all inappropriate for Wotan’s wayward girl. Occasional waywardness was much in keeping with her character; the tenderness of her farewell – suggesting perhaps that Brünnhilde understood a little more than usual the finality of her sentence – was touching and dramatically productive indeed. John Lundgren’s Wotan was dark of tone, commanding of presence, highly attentive – crucial in this of all roles – to the marriage of words and music. His shaping of Wotan’s second act monologue, his communication of its verbal and musical contours, their interaction with each other and with the orchestra, was excellent. A sense of chill, of reserve, seemed very much part of the interpretation, and varied according to circumstances. Georg Zeppenfeld’s Hunding proved outstanding: dark, although not so dark as one often hears of tone, dark of intent, yet not without charm. The return of video in the second half of the first act gave him a great deal more to do than would generally the case; his acting offstage, both before and after drugging, offered an important additional standpoint upon the action below. Sarah Connolly’s return as Fricka lived up to its Rheingold promise. There was no doubting her fury and righteous indignation. An excellent band of Valkyries worked together extremely well. Not unlike the Rhinemaidens the night before, their ensemble and solo work was equally distinguished; they, again, had much more to do, given close camera attention, than usual. Such was not a problem; it was, instead, an opportunity. Where I felt that opportunity was slightly missed was in Castorf’s conception itself. By the time we reached the third act, perhaps especially its first part, I could not help but wonder whether he had somewhat lost interest. It was a feeling much less strong than last time, but what earlier exerts considerable post-Brechtian force – the alienation of the world of Aleksandar Denić’s wondrous set designs and their tale of striking oil in Azerbaijan, 1942, from suspect, one presumes, ‘Romantic’ Lenz and Liebe – comes at some points to seem arbitrary again. Or at least it did to me; I may well have been missing the point. The first act in particular, as I said, benefited from Ventris’s Siegmund. Lengthy stretches of almost nothing happening at all onstage are, mercifully, no longer with us. What seemed to betoken contempt for the work, or stretches thereof, in 2014, no longer does. However, even at the end of the third act, when things pick up again dramatically, I wondered whether there was a little too much of Wotan and Brünnhilde not listening to each other, not even being in the same place. The case is at least arguable, though; maybe I need a more thoroughgoing purge of my Romanticism. Earlier on, the tension and indeed interplay work better. The trip back seventy years or so in time from the present-day (Wifi is available at the Golden Motel) does not bother me. Wagner plays with time, in any case, as is witnessed by the confrontation of his dual, Genesis-like creation myths (those of Alberich in Rheingold and Wotan in Götterdämmerung), with the march of dramatic time, both as experienced by us and, we presume, by the characters. He does not play with it as Castorf does, but Castorf’s play has us think: always a good and necessary thing in Wagner, whatever his preposterous ‘protectors’ might claim. I wish, as I think I did before, that more still might have been done with such disjuncture, but there we are. More to the point, however, we come to think of Rheingold all the more in retrospect as distant pre-history. That world of gods and giants is not identical to that of the succeeding three dramas, although there is, of course, much complex interconnection and interaction. We have seen, to a certain extent, where things might lead. However, we also come to see that we are on different historical, even ideological trajectory. ‘Toto, I’ve a feeling we’re not in Texas anymore.’ It is not just location, though; it is the shift to the Eastern bloc, as once we called it. Russian and Azerbaijani scripts, Pravda, even hints at socialist realism: are we perhaps giving Marx and Wagner a try, taking them at, if not their own word, then a sceptical yet not despising deconstruction thereof? If the world of the Golden Motel is so bad, then show us what you can do? Is Wagner, then, being found wanting by Castorf? Up to a point, I think, for it is difficult, on some level, to avoid the conclusion that the ‘real’ action is that of the oil strikes rather than that of Siegmund and Sieglinde? Unreliable narration nevertheless continues to make its point, although less so – a pity, I think – than in Das Rheingold. Where Castorf really scores, though, at least for me, is in the return of the gods to this world. Adopting local dress, customs, commercial practices, and indeed leading the latter, the gods do what we have always thought they did when they assumed human form. One might think as much here of Greek myth as Teutonic – as, of course, did Wagner. Do they, or does capital, reinstate Fate? Or is the opposition false? We are led to ask such questions, difficult to resolve, perhaps incapable of resolution. Wotan’s loss of his 'local' beard (seen first on film towards the end of the first act, as the god drinks his vodka) comes to seem akin to dropping of a mask. We behold him, as, unforgettably, Hunding does, in all his godlike terror. And we also recall, with Wagner, student of Feuerbach, that we have made him, as we have our other gods of capital, law, ‘love’, and so on. Marek Janowski and the Bayreuth Festival Orchestra seemed to me on surer form than the previous evening (not that they were bad then). There were still some odd orchestral balances: the clarinet line again, albeit to a considerably lesser extent. Perhaps the issue was more acoustical than intentional. More generally, though, Janowski’s emphasis on the woodwind in particular was balanced by a greater willingness to let the strings play out. He was more flexible of tempo too, usually to excellent effect. If the results remain more conventionally of the ‘opera’ world than its ‘musico-dramatic’ sibling or rival, increased command of the melos, the ebb and flow, worked very much to the drama’s benefit. We cannot always hear Daniel Barenboim, and there is much to be said for the marriage of general competence to a desire to bring out overlooked aspects of a work.